Not every workstation is alike or serves the same purpose, but when it comes to choices, the new WORX® Sidekick Folding Worktable, Pegasus Folding Worktable and Sawhorse, and WORX Clamping Sawhorses are bound to please. Each workstation has its own set of unique, useful features designed to meet do-it-yourselfers’ needs. It’s tough to put Sidekick in a single category, because this worktable is compact, lightweight and easy to transport. Yet, it can be drafted into multiple applications from supporting tabletop do-it-yourself projects to a food prep grilling station, concert picnic table, craft and hobby station or even a board game table top support for kids. This handy 13 lb. worktable sets up in seconds, supports loads up to 300 lbs. and provides a 23.6 in. x 23.6 in. work surface. It folds up, legs and all, for easy transport or storage. The sturdy, resin tabletop’s honeycomb construction is supported by a rugged, tubular steel powder coated leg set, which is corrosion resistant. When fully assembled, the versatile worktable stands 32 in. high. It connects to other WORX workstations, such as Pegasus, though link-lock. Four clamp dogs are provided for holding dimensional lumber and other materials. For sizing materials, inch and millimeter scales are molded into the tabletop. 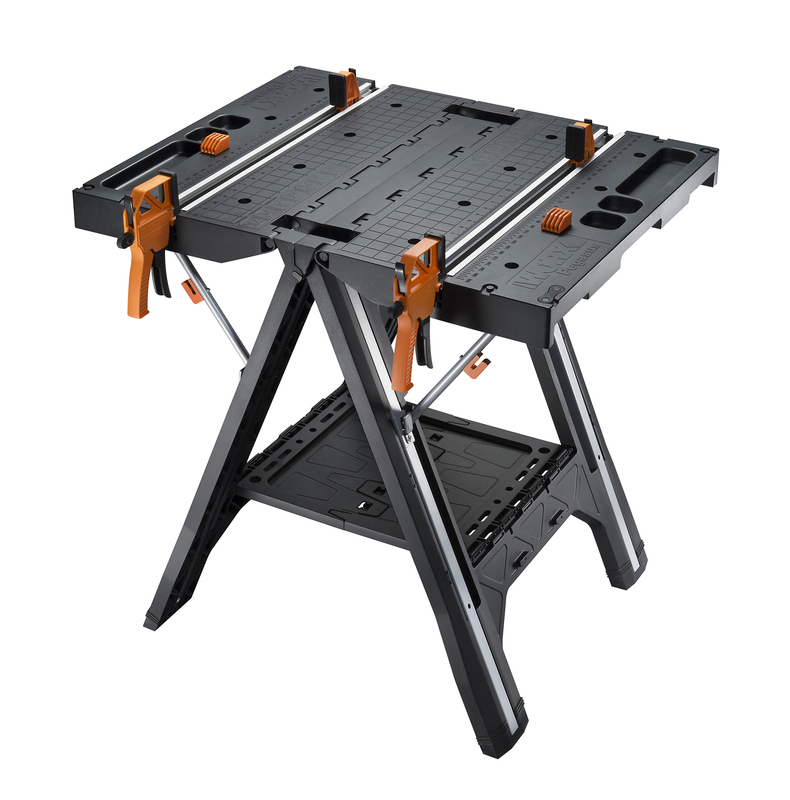 The WORX Sidekick Folding Worktable (WX066, $59.99) is available at worx.com. The worktable is backed by the WORX 3 year warranty. 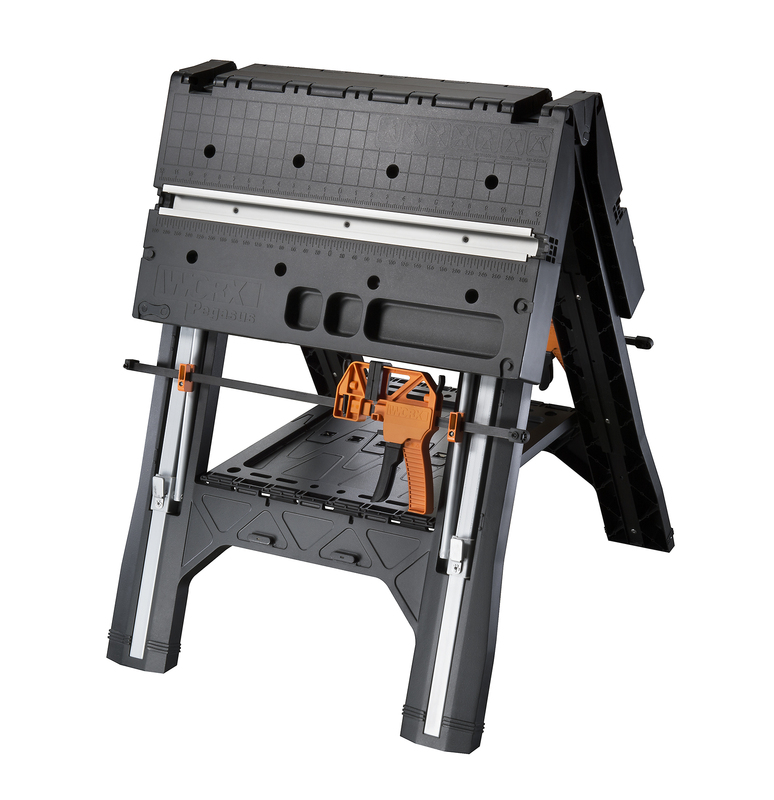 WORX Pegasus™ functions not only as a worktable but as a sawhorse. Key features are built-in channels to house two, 18 in. quick-clamps. Four clamp dogs are provided to secure circular and irregular sized workpieces. Pegasus has a 31 in. x 25 in. tabletop and, in the worktable position, it’s capable of supporting workloads up to 300 lbs. Innovative Pegasus interlocks with other Pegasus tabletops or Sidekick through Link-Lock. This expanded work surface is handy for cutting larger workpieces and other applications. The table’s quick-clamps are great for securing wood to be cut, glue-ups and sanding operations. Converting from a worktable to a sawhorse is quick and easy. The tabletop’s extension wings are braced with struts on both sides of the workbench. These wings fold down and lay flat as it converts into a sawhorse. Beneath the wings are storage slots for the quick-clamps. There also are notches at both ends of the sawhorse to hold 2x4s. When 2x4s are placed in the notches, they help elevate 4x8 sheet goods for cutting. The Pegasus Worktable weighs 35 lbs. As a worktable, it supports loads up to 300 lbs. and when set up as a sawhorse, its weight capacity is up to 1,000 lbs. The worktable stands at a comfortable working height of 32 in. The WORX Pegasus Worktable (WX051, $99.99) is available at worx.com and online retailers including Lowes, Menards and Amazon. The worktable is backed by the WORX 3 year warranty. 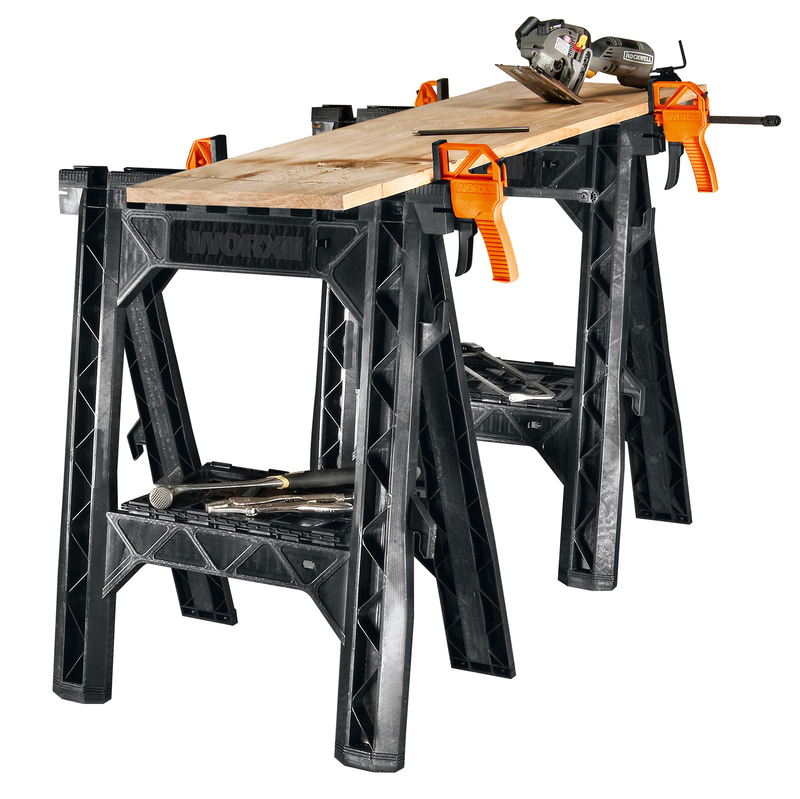 WORX Clamping Sawhorses provide another handy workstation. What’s different about these sawhorses is their integration of two 18 in. quick-clamps. The tops of the sawhorses have built-in channels to house the quick-clamps. When the quick-clamps are not in use, there’s a storage slot on the sawhorse’s frame. Sawhorses historically have been used to support boards or planks for cutting, but also are handy as makeshift work stations. 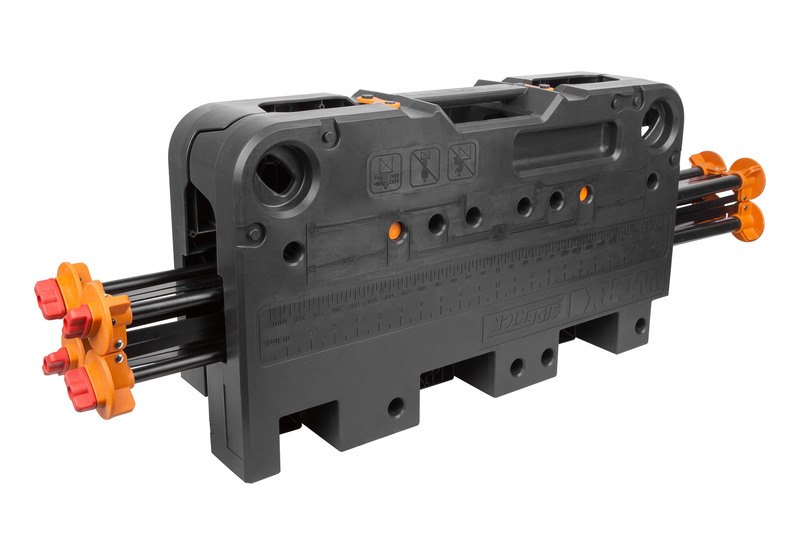 What makes WORX Clamping Sawhorses unique is that these work supports are not limited to cutting wood. The quick-clamps can secure copper, aluminum or PVC pipe, 2x materials, 4x4’s, sheet goods and other materials for cutting. 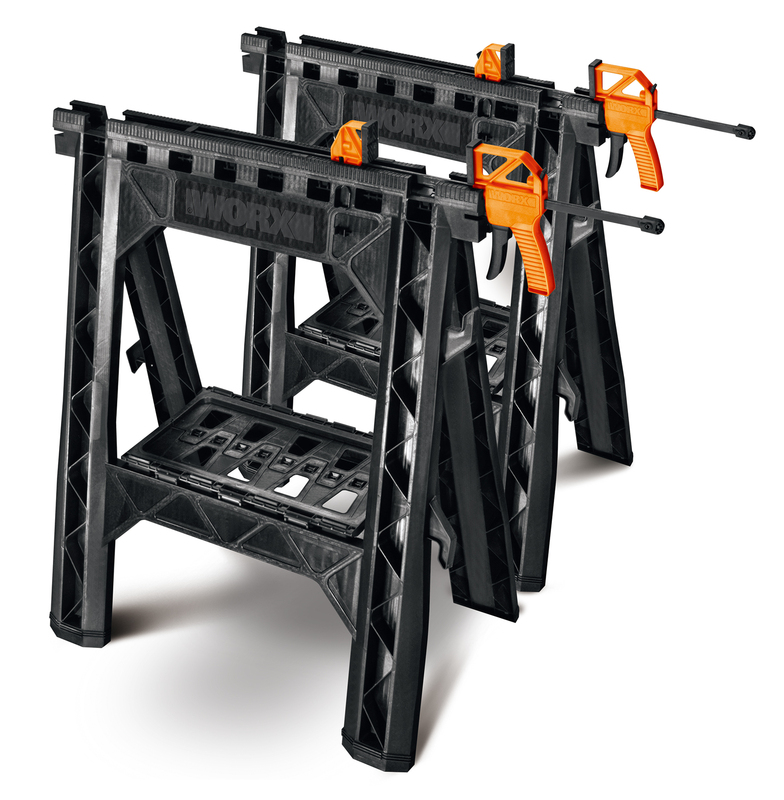 WORX Clamping Sawhorses support loads up to 1,000 lbs. The clamps can be used with or without the sawhorses. 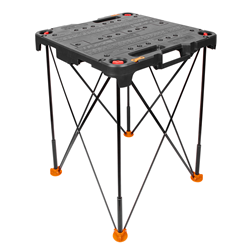 The lightweight and portable sawhorses weigh only 8 lbs. each (clamps included) are constructed of nylon resin. When opened, they stand at a comfortable working height of 32 in. The WORX Clamping Sawhorses (WX065, $69.99) are available at Lowes and worx.com. The clamping sawhorses are covered by the WORX 3-year warranty.